​8 lanes - 32 targets - 64 shots - 10-55 yards, 1" & 1 1/2" KZs 10 am practice, 11 am start. ​Vasyl can answer your questions about purchasing and operating one. ​Cardboard box (8" minimum thickness) filled with Rubber Mulch from any landscaping supply store. ​We are planning on holding outdoor air rifle bench rest matches in 2018. ​25M standard (50 yards and 75 yards optional). Big bore air rifles​ are allowed. ​Must provide your own portable bench rest table and chair. ​Please contact Chas DiCapua or Chris Sloan for more specific BR info. Ron Dumond of Lebanon, CT has kindly allowed the use of his personal property for CAG Club members. We can have informal field target and other air gun related matches on his property. Ron has allowed CAG to store its match related equipment in his storage shed. Please contact Leo Gonzales about setting up an air gun event on his property. ​We are a club dedicated to anything related to air gun shooting. 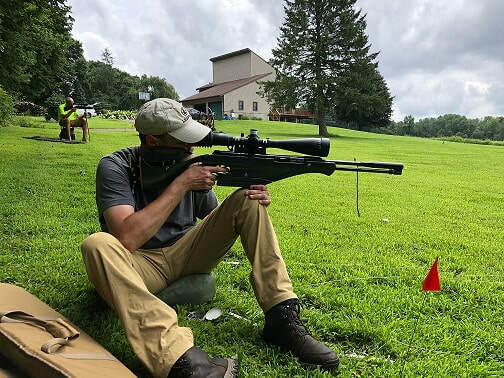 Whether it is air rifle or air pistol indoors or outdoors, we encourage, promote and hold air gun related events in Connecticut. Primarily we do outdoor field target matches. We are also planning on doing Pyramyd Air Gunslinger silhouette air rifle matches and outdoor bench rest air rifle matches as well. We are a registered member club of the NRA since 2018 April 4. ​We are a registered member club of the American Airgun Field Target Association since 2017 March 7. ​We are a registered member club of the United States Air Rifle Benchrest since 2018 January.